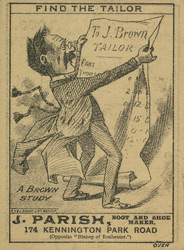 This leaflet is advertising the services of J. Parish, boot and shoe maker. Throughout the 19th century boots were popular with both men and women. There were many different styles and fashions like the ‘Blucher’, that had an open tab and the ‘Balmoral’ that was laced at the front. During the 1850s it was fashionable for women to wear wire frames skirts like crinolines and bustles. These tended to swing when walking and would expose the ankle and foot thus wearing boots was a way of preserving dignity.